Srila Prabhupada wrote Message of Godhead in the 1950s, while still living at the Radha-Damodara temple in Vrindavan, India. It was one of his first book-length manuscripts, yet wasn't discovered until years after he had come to the West. It was first published in 1991. With vivid examples and clear, gentlemanly English, Prabhupada makes the case that there's much more to reality than what our senses can perceive. "The human being is therefore considered to be the highest of all creations," he says, "and we must understand the nature of this higher standing." One can't be fully human without a basic understanding of the self, the supreme self, and the purpose of life. 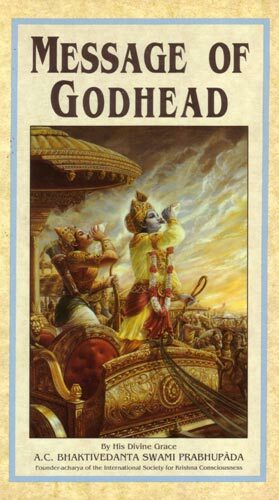 Message of Godhead is one of Srila Prabhupada's slimmest written volumes, yet it stands as a compelling, comprehensive introduction to all the major points of Krishna conscious philosophy, which he explains in much greater detail in his Bhagavad-gita As It Is and Srimad-Bhagavatam.